Spec-D Tuning offers a variety of automotive lighting and accessories for any type of import or domestic ride. Spec-D headlights are regarded as one of the best in terms of quality, design, and value for money. 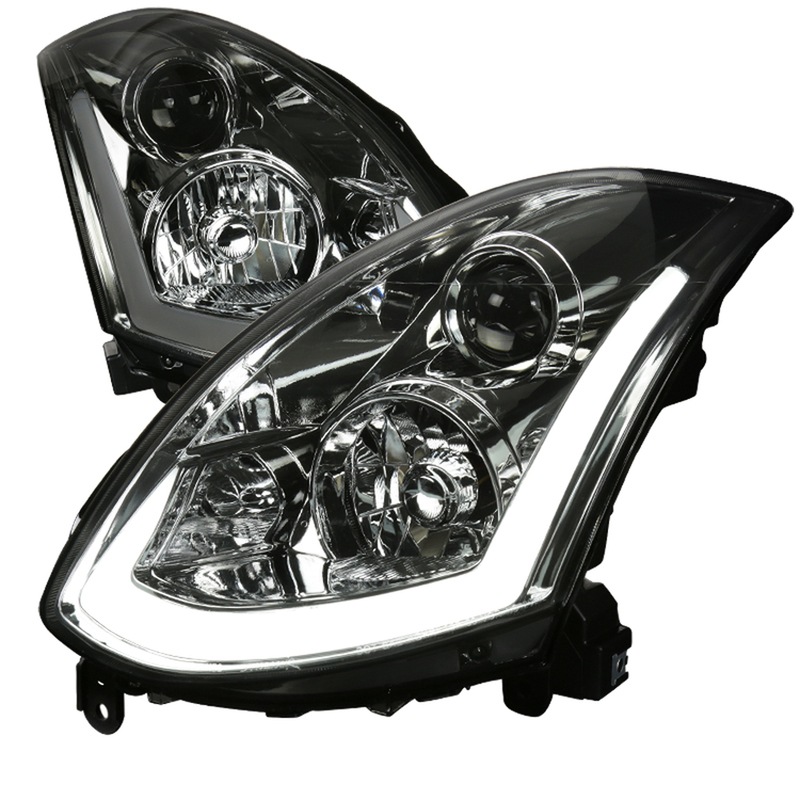 Spec-D offers an intense array of headlights to give your vehicle an OEM or upgraded look. Spec-D projector headlights are one of our bestsellers. The company offers projector headlight upgrades for any make and model. Unlike the stock or factory headlights, projector headlights are engineered to cast a wider and more focused beam of light on the road ahead. What’s more, Spec-D projector headlights are crafted for a precise and exacting fit with no further mods required. Euro headlights are available in chrome and black housings with either clear or smoked lenses. If you want to give your Japanese or domestic car an upgraded flair, take a closer look at Spec-D Euro headlights. The Euro look is a big trend in the aftermarket industry and gives any vehicle a more refined and cleaner style. Spec-D is also known for their powerful and hi-tech LED headlights. LED bulbs will give your vehicle a modern and newer look while giving it better lighting along the way. LED bulbs are rated to last longer and burn brighter while consuming less power. LED headlights will make your vehicle stand out day in and day out! Spec-D Halo headlights are special. In many cases, projector headlights are accompanied with Halo driving lamps to improve style and visibility. Halo headlights were first utilized by BMW and quickly gained popularity in the tuning and aftermarket crowd. It is safe to assume Spec-D will have the right lighting options for any make and model of car, truck, or SUV. Sam’s Motorsports is proud to offer original Spec-D headlights at discounted prices. Who say’s upgrading your vehicle means spending a lot of cash? With a varied array of Spec-D projector headlights, LED headlights, Halo headlights, and other lighting accessories, Sam’s Motorsports will ensure you get the perfect set of headlights for your beloved ride without burning a hole in your pocket. 2003-2005 Infiniti G35 Spec-D Headlights, The Spec-D Headlights is designed specifically to fit your 2003-2005 Infiniti G35 without any modification to your beloved Infiniti G35. If this Spec-D Headlights is not exactly what you are looking for to accessories your 2003-2005 Infiniti G35, please don't give up just yet. Our catalog has huge variety of parts and accessories for your Infiniti G35.